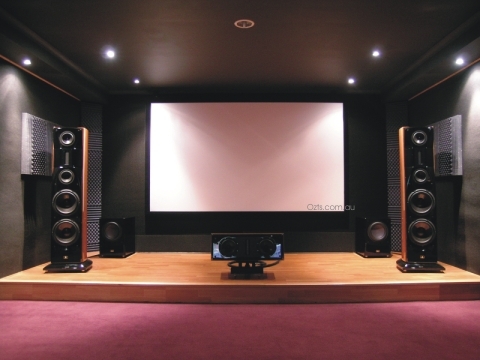 Hi Richard, just a short note to say absolutely thrilled I am with my Majestic Evo4K ozts Theatre Screen. As you know we evaluated three other screens before settling on the Majestic Evo4K. Our decision was based on technical performance, price and construction of materials used and ease of assembly. I was particularly impressed with the packaging, so well protected from any unforeseen event that may befall it during transit, a credit to your dispatch department. The screen was assembled as per the well laid out instruction manual that you have on the web site with no difficulties experienced. The finished product far exceeds our expectations and I can say your product is excellent value and in our view confirms our decision to install your product to best display the H.D picture performance of the Sim2 Mico 150 DLP projector. 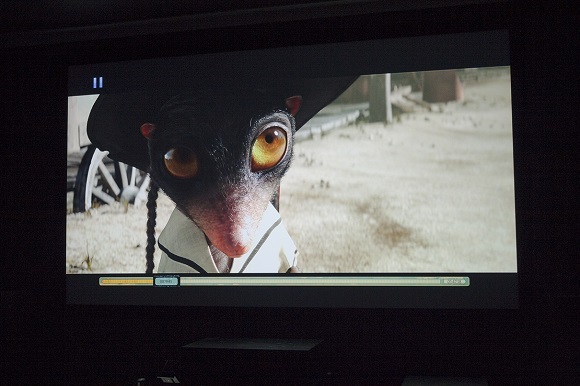 The picture from the Sim2 Mico 150 is absolutely astounding, as you know the projector uses single chip DLP projection system and the black level achieved on the ozts Majestic Evo4K is remarkable. The Sim2 Mico output projected onto Majestic Evo4K has to be seen to be believed. For starters, pictures generally look more dynamic, with some remarkably pristine and bold whites able to reside in the same frame as rich black levels. The extra brightness also helps the M.150 produce noticeably cleaner, clearer shadow detail in dark areas of the picture, making sure dark HD footage looks every bit as richly detailed and gloriously HD as bright footage on the Majestic Evo4K screen material. Thanks Richard for a great product. I have attached some photos for your perusal. 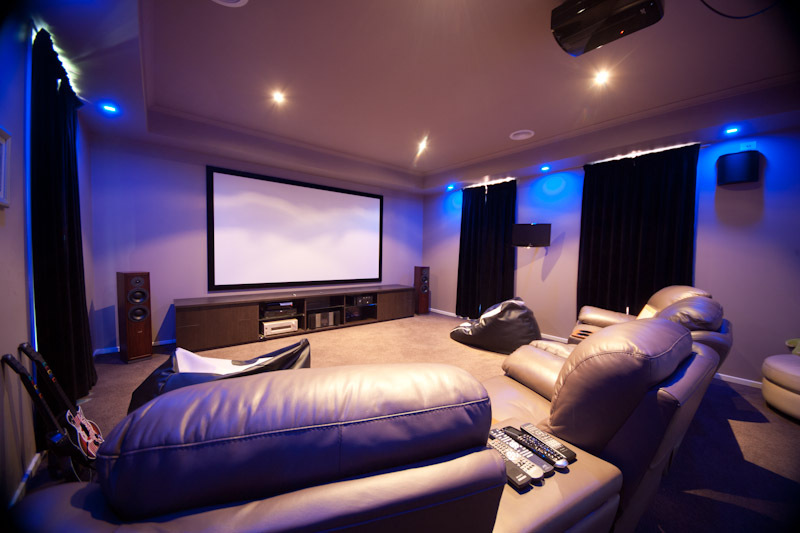 For my first purchase of a projector based theatre setup, it could not have been a better experience and in regards to the screen, l have Oz Theatre Screens and Richard to thank. Firstly the technical info section on Ozts website was excellent, this was as a great insight on how to make the right decision in regards to screen size and material especially the installation PDF that has all the screen and frame sizes. This may sound like a minor point but this allowed me to set the projector up just projecting on a blank painted wall and accurately compare different sizes (eg:100,110, 120)of what the actual picture size would be and to also know where the frame would sit and therefore where my front speakers would/could be placed. So this measurement data was priceless, so good service and l hadn’t even bought the product as of yet. Just prior to ordering l called OZTS and spoke directly with Richard which was a great experience, to know you are speaking with the company owner. The order process was great and Richard even allowed me to change my order at the last minute from 110” to a 120” EVO Ultra 4K 16:9 which was the best decision l made. The packaging of the product was great and reassuring. l thought that the attaching of the screen material to the frame might have been tricky but the assembly was straight forward. Though two pair of hands is the best way to approach it, and just a small bit of patience is needed when trying to get the last corner of material fixed and wrinkle free....all l can say is if my wife & l can construct the screen then anyone can because we are not handymen! I was expecting the wall mounting process to be a bit tedious when you think you’ve got an almost 3m wide “picture frame” so to speak that you are trying to hang....well the clips that are attached to the wall caught the frame as per intended FIRST GO!....so great design. Unbelievable....great contrast, great colour and did l say HOW BLACK that Fidelio velvet is! Richard said to me it is like looking through a window and he was right. It’s like going to a commercial theatre with NO ADMISSION FEE. 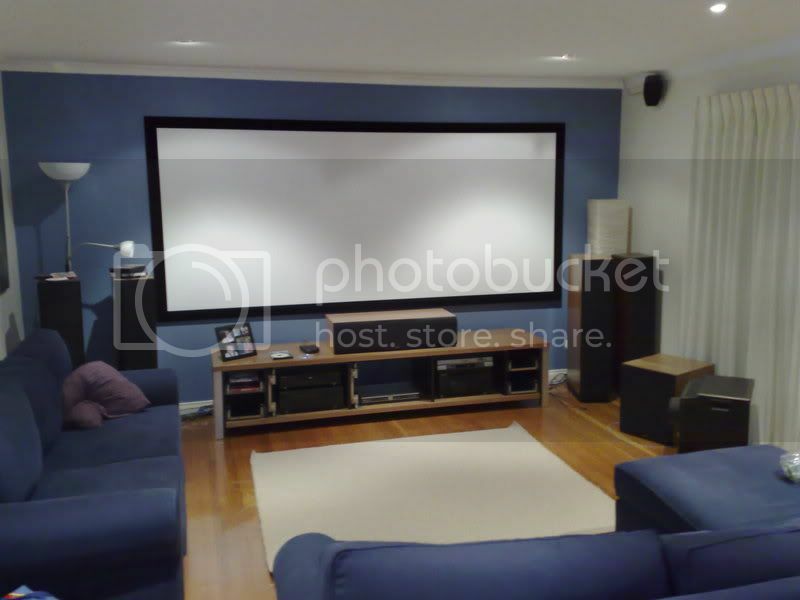 I originally planned for this room to be equipped with either a plasma or LCD in the 65 - 70” size and decided after a bit of research on Australia’s DTV forum that the projector/screen option was something to seriously consider. All l can say is thank god l made this decision as the experience of watching a Blu-ray movie whether it’s 2D or 3D on a OZTS Evo Ultra 4K 120”screen is head and shoulders above 65/70” plasma/LCD. 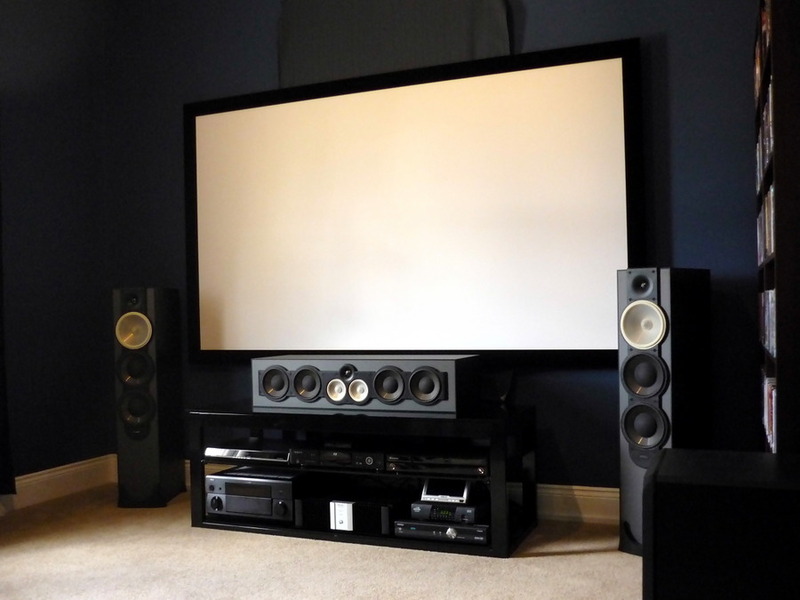 On a final note, Richard is consistently present on forums like the DTV forum offering advice which is very reassuring and his company also sells projectors, anamorphic Lens options and Krix speakers. So as a consumer it is very rewarding to be able to deal with Australian business like Richard’s OZTs that have passion and in-depth knowledge of what they sell....as opposed to what consumers normally have to deal with in regards to BOX MOVERS! To Richard and the team at OZTS....Keep up the great work! I know it has been a while but wanted you to know that buying your screen was the best thing I could have done. All your calculations were spot on and I put the screen down as far as I could from the cornice and that combined with the wide black border virtually eliminated reflection from the ceiling which I should eventually paint a dark colour. Quality of the picture and having a much bigger screen really does add a big wow factor. I love the screen and so does everyone else. 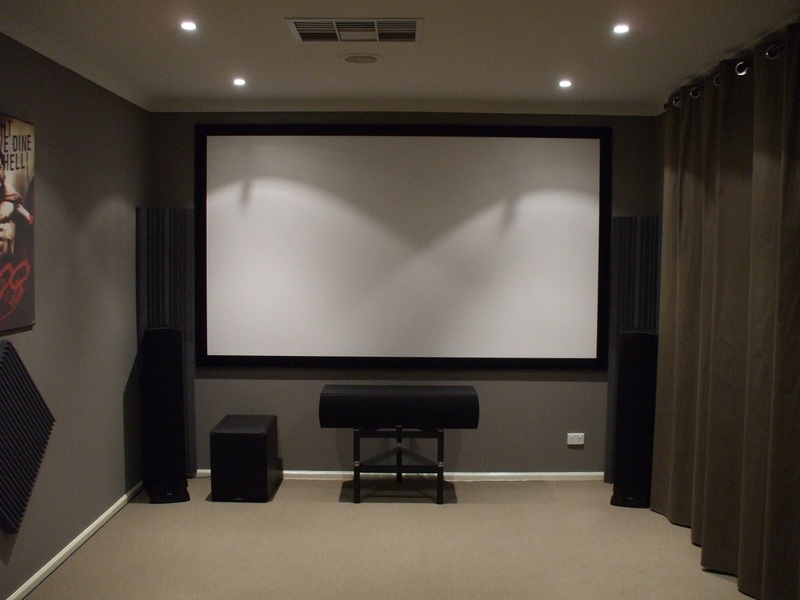 From my first enquiry with the Oz Theatre Screens brand I found Richard to be very helpful, I had many options for the setup of my new theatre screen and Richard was very helpful with suggestions of how to get the most out of my room. 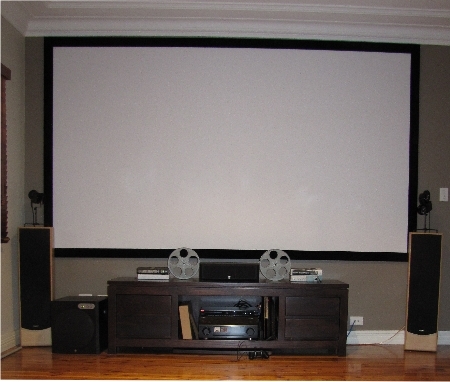 Eventually I settled on the 2.37 Majestic Cinemascope Screen with Acoustic Vision. When the screen arrived I found it to very well packaged and in perfect condition from the journey. When I opened the package the first thing that stuck me was how black the Fidelio Velvet frame was, just so soft and deep, you can see how effective this is if have any overscan from your projector, the frame shows no sign of the image. Once the screen was installed I couldn’t wait to test it out, the results were amazing. The sound travelled though the screen flawlessly, you get the whole experience and having the centre speaker right where the vocals are really make the whole movie experience come together. I was concerned about the projector casting light through the screen but this was not a problem, as an added precaution Richard advised to make the area behind the screen black and the results are perfect. Now for the picture, it really is fantastic, the first movie I watched I couldn’t believe my eyes, some home theatre guys had tried to sell me a screen which was about five times the price and they had demoed a screen that was in fact about 13 times the price, to be honest I couldn’t really where the cost difference was, the picture I get from the Majestic is as good as any other I have seen anywhere. I have been using the screen now for about 6 months and I watch at least one movie a week and even now after all this time I still sit there and find myself at some point during the movie thinking to myself, that picture really is amazing. Greater value, great quality and great customer service… This is all you can ask for, thanks Richard.” J. Martin. 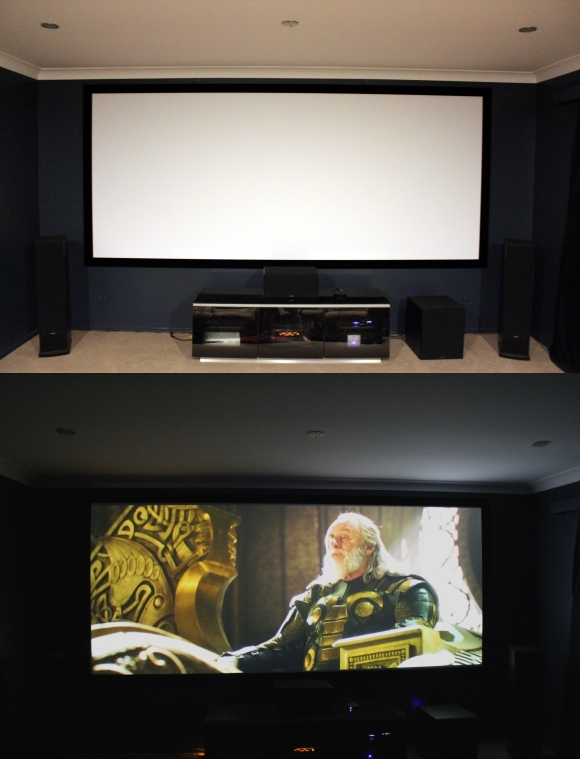 Having owned 2 projectors over the past 8 years, I have gone from watching films on a wall, to a 120" 16X9 Aurora screen and now to a 150" 2.37:1 screen Majestic Evo3D. Running a Mitsubishi HC6800 which does 2.37:1 Constant Image Height without an anamorphic lens is astounding to view on this screen. Depth perception is further enchanced as no black bars are visible within the frame, and the Evo3D material has enhanced picture quality all round. I am noticing more color and deep blacks and just a clearer image all round. The quality of the frame is well worth the price and is top quality. Unpacking and putting together the frame did not take to long. Overall, I am very happy with the screen. The time it took to ship was fast, and Richard Ward's prompt email responses was great. Support a well made Australian product! "Ever had that sensation where you go 'WOW' because what you have just seen so far exceeds your expectations that it blows you away? Well seeing a movie on my Oztheartre 130 inch Majestic with evo 3D through an anamorphic lens for the first time was my WOW moment. It quite literally took my breath away. I've had various projectors on 92 and 100 inch 16x9 screens for years now and whilst these are impressive nothing really prepared me for how good a Scope setup in my own room would be. Richard thanks for bringing a top quality project to Australia that in my opinion represents the best value for money on the market. regards Michael Hood"
HI RICH, JUST THOUGHT I WOULD DROP YOU A LINE TO LET YOU KNOW HOW HAPPY I AM WITH MY 130" SCOPE SCREEN I RECENTLY PURCHASED FROM YOU. THE SCREEN SIZE YOU RECOMMENDED FOR MY VIEWING DISTANCE IS PERFECT AND THE EVO3D FABRIC JUST GIVES EVERY MOVIE I WATCH ON IT SO MUCH MORE "POP" AND WOWS EVERYONE WHO SEES IT! THE BLACK FEDELIO FABRIC OVER THE FRAME SOAKS UP ANY OVERSCAN I HAVE AND LOOKS ALL CLASS. AS FAR AS PUTTING THE SCREEN TOGETHER WELL THE INSTRUCTIONS AND PROCESS COULDN'T BE ANY SIMPLER. I HAD IT TOGETHER IN NO TIME AND THAT WAS WORKING BY MYSELF. ALONG WITH YOUR GREAT ADVICE, SERVICE AND COMPETITIVE PRICING I WOULD RECOMMEND ANYONE TO BUY ONE OF YOUR SCREENS. AMAZING VALUE FOR MONEY AND PERFORMANCE 2ND TO NONE. 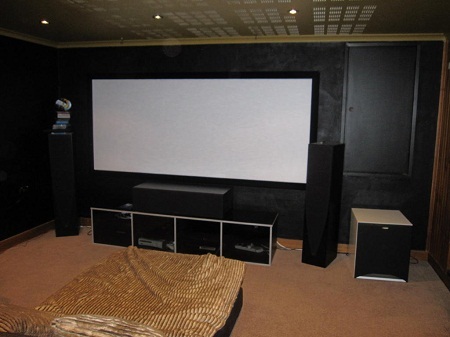 "I have a Majestic Fixed 120” 16:9 screen fitted with the EVO 3D fabric. 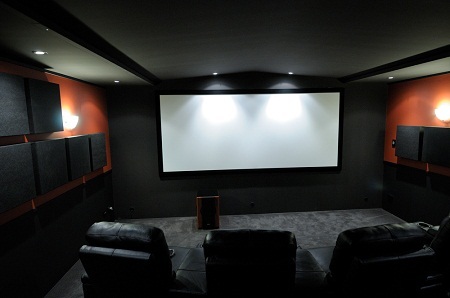 I use an Epson E-TW4000 projector in a dedicated light controlled home theatre. My viewing pleasure is mostly Blu-Ray movies and HD gaming on the Xbox 360. This screen is awesome. Brilliant clarity and resolution, blacks are very black, contrast is excellent and the screen is flat and smooth. 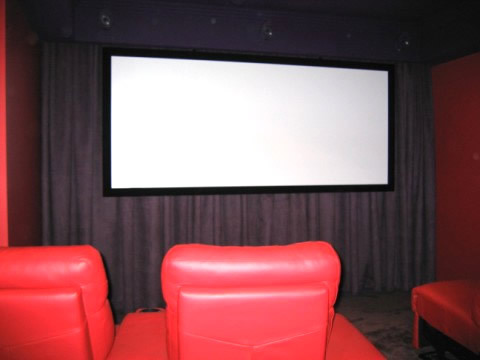 The velvet covered frame reflects no light so there are no distractions to enjoying a movie. Assembly was quick and easy, and even mounting it on the wall on my own was easy because it is so light. Add to that it is excellent value for money. 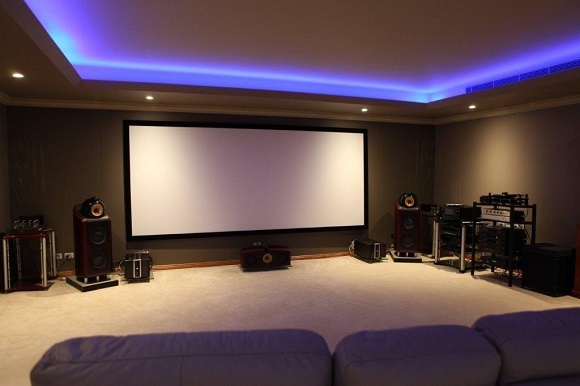 In my next home theatre, with a bigger screen I will definitely go for a majestic again. 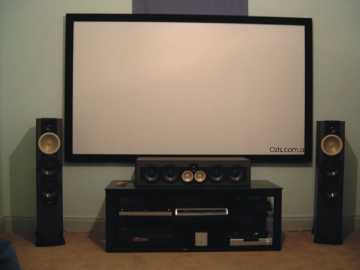 Thanks again Rich"
I'll add my support to not only the quality of Rich's screens at OZTS, but also say he was very patient in dealing with my numerous questions before we settled on our 110" 16:9 Evo3D screen. Putting it together was pretty easy, with the retaining strips being pushed in by hand mostly, and then tapped down with a lightweight hammer. Took some care to get uniform tension but nothing more than that. And I was really impressed with the way it was packed. Coupled with the Sony HW10 my wife and I (and everyone we have shown it to) has been amazed by the picture quality. And the blackness of the fidelio velvet has to be seen to be believed. 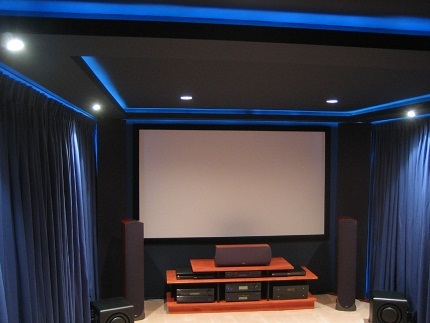 Custom 106 inch 16:9 Majestic with Evolution3D fabric fitted into a recessed cavity in Chealsea Heights Victoria. 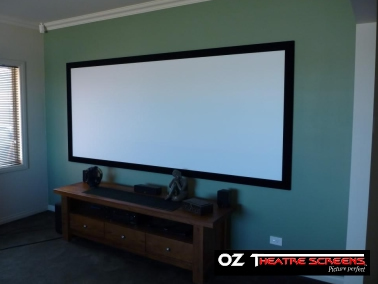 I am so impressed with my Oz Theatre Screen that I purchased from you recently that I was compelled to write a short review on your excellent product. 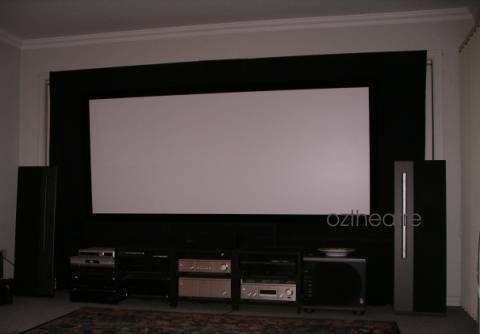 I conducted a large amount of research and many auditions before deciding on the Oz Theatre Screens 'Majestic' 100" screen with Evolution3D fabric and velour surround for my home theatre. What impresses me most about this screen is the high quality of the screen materials, its ease of construction, and of course the faithful and detailed image that it yields. I have witnessed screens costing twice as much (using the same projector) that could not compete with the Evolution3D fabric. I run both Blu-ray and HD DVD players in my home theatre, and this screen allows me to see every bit of detail that these high def formats have to offer (see pictures above). The Evolution3D fabric offers a wide viewing angle and accurate colours, to the point where the limiting factor in my system is now clearly the projector! And while the velour surround looks attractive, it also enhances the image and gives greater contrast. 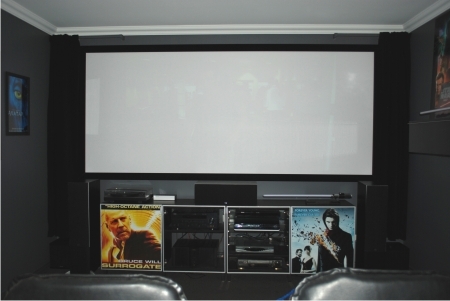 Oz Theatre Screens have produced a high performance screen that offers fantastic value, and is manufactured and sold by people who know what they are talking about. They also and offer great customer service and have a very helpful and informative website. Thanks so much Oz Theatre Screens! I would recommend your screens to anyone without hesitation. I'm loving the screen - much improved brightness, contrast, colour and perceived image depth - we're noticing details, particularly in the backgrounds, that we haven't seen before. It's a bit like when I upgraded from 720p to a full HD projector... 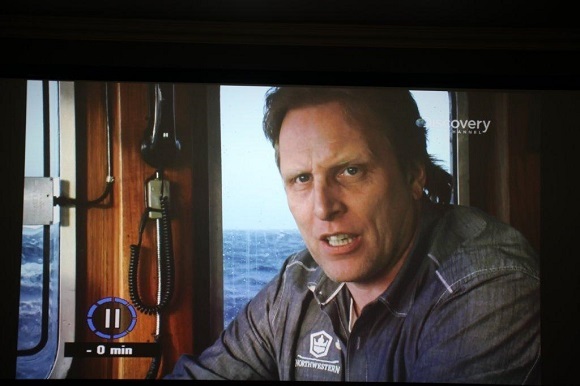 Particularly surprised at quality on standard DVDs - I was a little worried that they wouldn't cope with the extra zoom. Blu-ray and HD-DVD look fantastic. My home setup (while much smaller) has far superior focus and image quality than the local cinema complex. Have started watching all the favourite movies again. LOTR: Two Towers the other night was a revelation. Just letting you know the screen is all setup, to say I am over the moon would be the biggest understatement ever!. It is absolutely amazing!. You have made a fantastic product, here is a picture of the installed product. 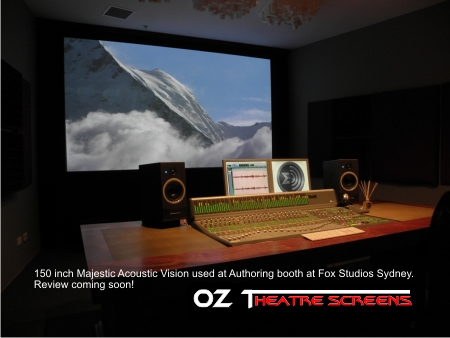 150 inch 16:9 Acoustic Vision Majestic Screen being used at Authoring booth Fox Studios Sydney. 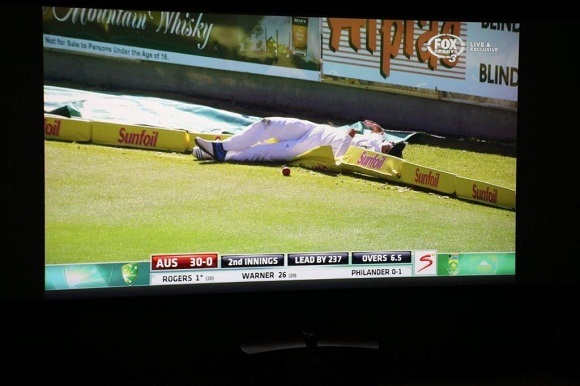 Bought my 135inch 16:9 screen from Richard at Oz Theatre and haven’t looked back. It arrived in high quality, rock solid packaging within days of ordering, and was pretty simple to put together. NICE. Richard has been available QUICKLY to answer any and all queries before, during and after my purchase. That matters to me. He knows what he is talking about, so if pre sales and post sales service is important to you – I can’t say any more than that. As for the screen itself - there may be more famous brands out there but I don’t think I could have found better quality or value anywhere. Hundreds of happy customers will tell you exactly that on any of the forums, and I’m a +1 !!! Picture Quality is fantastic. Gets the best out of my JVC HD550. I auditioned the projector at several high end stores who use the aforementioned, famous brand, expensive screens in their demo rooms, and I think I got a much better deal than them! It’s great to be able to sing the praises of an Australian owned and Australian run business, who are offering fantastic quality and value. 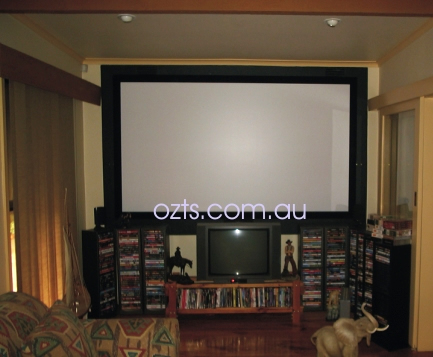 If you are in the market for a screen- you don’t need to look any further than Oz Theatre Screens. Just wanted to touch base and let you know how our 120” Majestic has settled in. 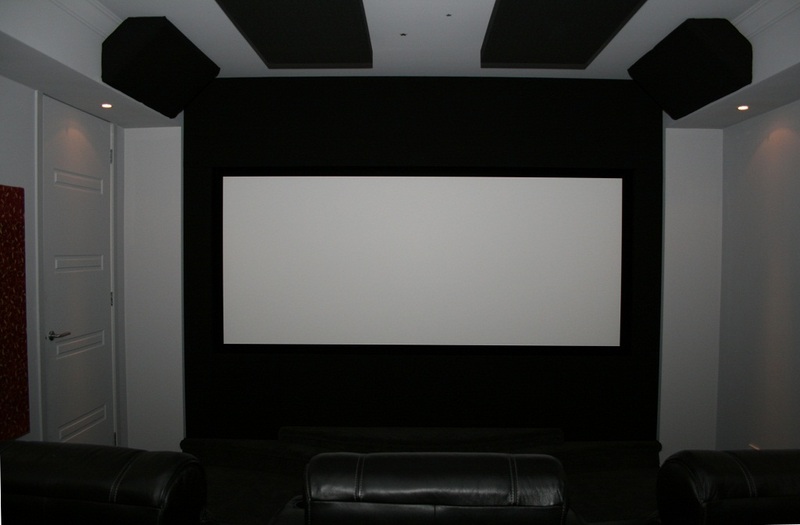 As mentioned we replaced the Screentechnics in our main demo room with your Majestic to cope with the new 1080p projectors. The improvement was jaw dropping. To be honest, I wasn’t expecting that much gain in sharpness and depth. You were right about the Evolution 3D screen material, no bleed through and a totally uniform surface. The new Mitsubishi HC 5000 1080P projector looks amazing on this screen. We have a professional room setup for commercial systems with a pro Runco model on a high end Stewart screen, and the HC 5000 on the Majestic is so close to the pro system it’s not funny. We will be recommending your screens to our clients who want superior performance without spending a fortune. 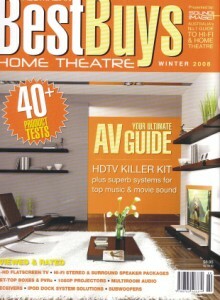 23.6.08 The Majestic Fixed Frame Projection Screen gets a rave review in the latest issue of Best Buys Home Theatre Magazine. "In short, the performance of the screen was flawless"
"It's hard to think of an easier, yet more secure system for affixing the screen material to the frame"
"The four sections of aluminium frame were machine cut with extreme precision"
"The performance of the screen material itself was superb"
In terms of "bang for your buck" the OZTS Evo3D is hands down the winner in the Australian market, with one important qualification - you MUST have the ability to totally light control your viewing environment as it has an extremely white and highly reflective surface that will pick up ambient light and wash out your image. I too have one of OZ theatre's new majestic screens and can also vouch for it excellence. I'm using an Epson TW2000 PJ onto a 110" 16:9 screen with a throw distance of approx 4.5m. I used to project onto a wall, and after I installed my OZTS screen, the difference was immediately visible. The first thing I put on was LOTR EpII. The start, where the camera is flying around the mountains, was so immersive, it nearly gave me vertigo. You will not reget spending the cash on an OZTS. My screen is a 3m wide scope screen using the Evo 3d fabric, and the whole thing, delivered was something like $1200!!! Now, a smaller, 16:9 screen will be cheaper, and you'll save on shipping. Do yourself a favour. Don't put good money after bad by buying melamine board. Spend the money ONCE doing it right, and be done with it. Could not agree more with Chris. Best bang for your buck without a doubt. The Evo3D produces a stunning image and the assembly is very simple. I've had mine for about 15 months and never had to re-tension it, doesn't look like i'll ever have to either. After seeing what mine has been like one of my mates just purchased one to go with his new Sony VW60 and the image quality is sublime. When I eventually upgrade to a 1080p projector I'll most definitely be keeping the screen. And now, finally, a ~114" 2.37:1 Oz Theatre Screens Majestic Cinemascope Screen with Evolution 3D fabric (yes, that's 6 screens in 5 years, and yes, my wife is not happy about it). I managed to on sell all of the above bar the Longhorn Pro which, due to adhesive used in the frame and the textile based fabric, resulted in a savage tearing of the fabric when I tried to pack it away for moving. Whatever you do, do not be tempted by the claimed convenience and benefits of "daylight" screens - the technology is still far from perfect, and unless you have the perfect viewing environment to allow set up (no light coming from the direction of the projector other than the projector, offset above or below the screen by 10% of screen height, mounting of projector at least 2.5 - 3 x screen width away, etc. 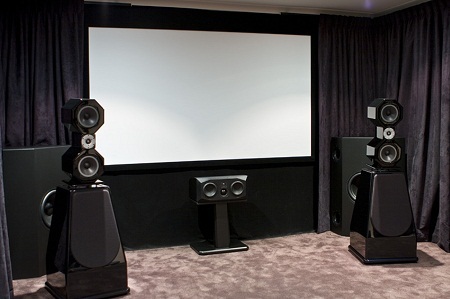 ), and a super powerful projector (2000+ lumens after lamp decay minimum), they deliver sub-par performance and are not worth the significant expense involved - this goes for Planar Xscreen, LP Morgan Galleria Noir, and DNP Supernova (the last two are effectively the same screen). One day, maybe they will get it right, but not yet. Personally I think they would be better using the ambient light rejection properties of these screens on ordinary screen fabrics to prevent general washout from light coming off reflective room surfaces and give up the whole idea of daylight viewing. Alas, that's not the direction the technology is going. In the meantime, spend the money on some good blackout curtains instead - they will cost less, and improve the value of your house. Trust this coming from someone who learned the hard way. As for screen size, screen height is the important factor, and I think room length / 3.68 = screen height, with seating distance at 3 x viewing height usually works out correct. 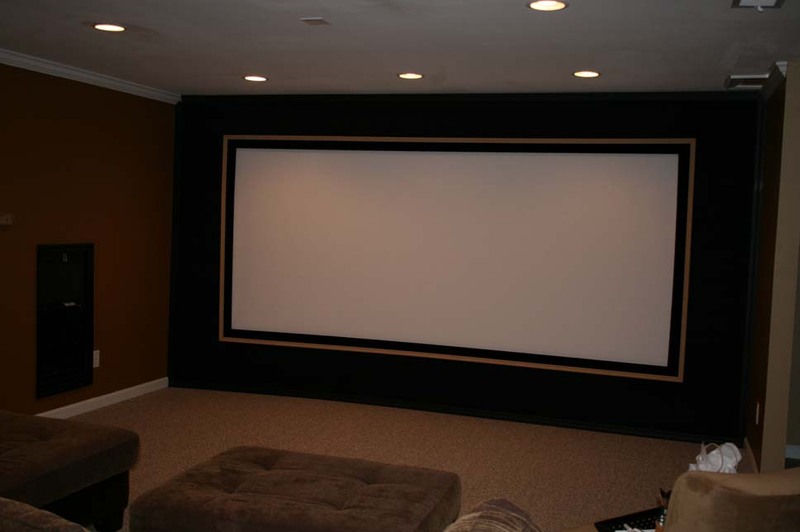 Tempting as it is, do not get a screen that is too big - your projector will have to be super powerful to light it up, and light reflecting off your ceiling, walls or carpet will kill picture quality if the screen is too close to those surfaces (the viewable surface of the screen should be at least 30cm from any of ceiling, walls or floor, and preferably more). 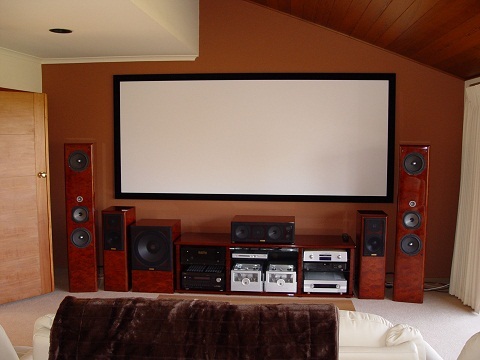 Of course, once you've got the right screen height, it's going to be the same height regardless of screen aspect ratio - 1.33:1, 16:9, and 2.37:1 - so you might as well go for Cinemascope if you have the horizontal room to do so in order to future-proof your set-up. My experience has been, you don't really notice the black bars on the side of the picture as much as you do black bars above or (to a lesser extent) below when watching 1.78:1, 1.85:1 or 1.33:1 material on a Cinemascope screen. I happily watched "Cloverfield" (1.78:1) and the last couple of episodes of "Twin Peaks" (1.33:1) on the screen last weekend, and didn't even notice the side bars. 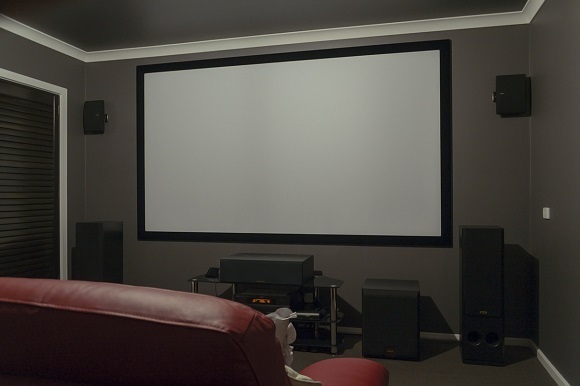 As for brand of screen, the Oz Theatre Screens Majestic Cinemascope is by far the best screen I've owned in terms of price to performance - and I've owned a lot of them (as my wife likes to point out). The Da-Lite was great for mobility during my rental days, but if you don't need that, a fixed screen is the only way to go, and you'll get your best bang for buck for a fixed screen at OZTS. You can also get the OZTS factory direct, which cuts out "middle-man mark-up" and the need to deal with anyone other than the manufacturer - this in turn greatly improves customer service, response time and sorting out of errors (like couriers who don't follow instructions). Again, trust me, this is worth a lot more than it seems. Look at Oz Theatre Screens. Their quality is far superior in terms of fabrics offered and the border (fidelio velvet). The only down side is they done do a curved screen.....but these start from $7500 for a curved SMX screen....and then you need to know how to set it up correctly. Oh and they're heaps cheaper. It's a pity that it took me so long to change to a commercial screen. It was only after I started playing with anamorphic lenses that I needed a new screen. I too went with the OZTS Majestic with Evo3D and the improvement over my home made screen was unbelievable! The biggest problem was that the Evo3D fabric really pointed out that my 10yo projector was on it's last legs, hopefully in a few weeks I'll have a new, quiet projector above my head. Long story short, check out OZTS, you owe it to yourself to at least consider that path. Just a quick update on my project. I decided to completely change my room around and remove the plasma completely. 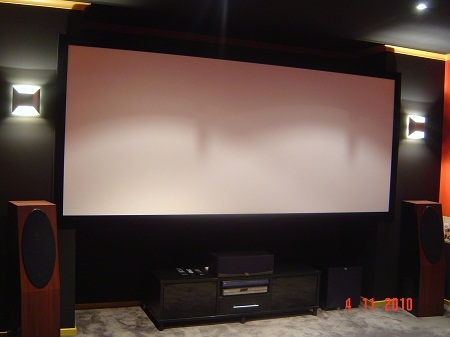 On Saturday I started painting the room and on Sunday morning I installed an Oz Theatre Screens 120" 16:9 Majestic Evo3D fixed screen. To say that I'm impressed would be an understatement and I'm glad I went with the fexed screen rather than a drop down as I think it just looks more imposing and crisp in the room. So based on less than 1 weeks worth of viewing I can still say that I would recommend the OZTS screens to anyone looking for a new screen.